A step-by-step guide to getting your employees obsessed with customer service. Rated one of the best customer experience books of all time by Book Authority. The Service Culture Handbook is a step-by-step guide to help you develop a customer-focused culture in your organization. Jeff is an author, consultant, and trainer who helps customer service teams unlock their hidden potential. In 2016, Jeff was named one of Global Gurus' Top 30 Customer Service Professionals in the world. He's one of ICMI's Top 50 Thought Leaders to Follow on Twitter and an HDI Top 25 Thought Leader in Technical Support and Service Management. Jeff has developed more than ten customer service training videos on Lynda.com. He's also the author of Service Failure: The Real Reasons Employees Struggle with Customer Service and What You Can Do About It. 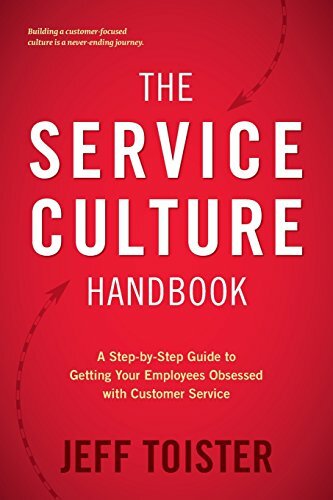 You can find The Service Culture Handbook in paperback and Kindle formats. Get it autographed! Email your mailing address and receipt or order confirmation to jeff (at) toistersolutions.com. You'll received a signed bookplate that you can stick inside the front cover of the book. Quantity Discounts (paperback only): Visit 800-CEO-READ to order quantities of 2 or more. Discounts up to 35% are available. Book Jeff Toister to speak as part of your event.